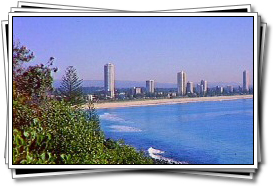 Just 50 miles (80km) south of Brisbane, the Gold Coast is world famous as a tourist destination - and it is small wonder why! 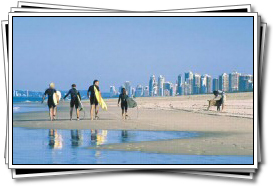 If you like sun, surf and apparently endless golden beaches then you'll love the Gold Coast of Australia. The Gold Coast is a kaleidoscope of coastal resorts, stunning islands and magnificent beaches where the transparent blue of the warm pacific ocean gently breaks onto pristine white sands. 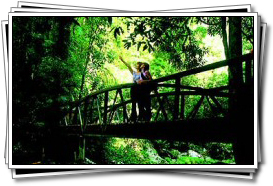 The climate of this popular area of the Sunshine State is almost perfect all year round, with an average of 245 days of fine weather each year and daytime temperatures above 22 degrees for 279 days a year. 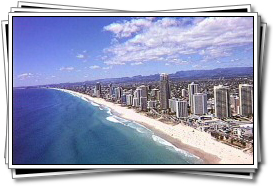 The aptly named town of Surfer's Paradise is a popular destination in the area, with hotels right on the long golden beach onto which the famous surf breaks. By day this is an extremely popular location for suntanners and surfers alike, but by night it is no less active. The nightlife has glitz and glamour with international acts, and the food of almost every nation on earth is represented in the huge range of restaurants and cafes. blue of the Pacific Ocean breaks onto the Gold Coast's 35 golden beaches under a sub-tropical sun, and offshore there are islands to visit and explore. The area features theme parks and attractions, golf courses and yachting, excellent restaurants and shops, sport and wild life. Is it any wonder that this is Australia's most popular holiday destination? The Gold Coast region of Southern Queensland has a fabulous and truly comfortable sub-tropical climate, ideal for outdoor enjoyment all-year round. The Coast averages 245 days of fine and sunny weather each year. As with nearby Brisbane, even in winter the surf and beaches remain popular with temperatures averaging around 20°C, while summer never quite gets too hot to prevent outdoor activities. During the winter when temperatures are pleasantly cool and rainfall is low.